SPY STUFF is almost here! 15 Jul SPY STUFF is almost here! 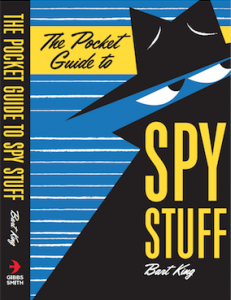 I know this is embarrassing for both of us, but the new, revised, updated edition of The Pocket Guide to Spy Stuff comes out on August 14. And not to brag, but you’ve never seen anything like it! LEGAL NOTE: You may have seen something like it. However, this *updated* version is stuffed with expanded material on timely topics like misinformation, propaganda, and spy-jinks! Plus, jokes. Jokes are good. It’s at Indiebound, Powell’s, Amazon, and Barnes & Noble. Or, just ask your local library to order it!